The civilian use of drone aircraft needs to be regulated amid security and privacy fears, according to Google's executive chairman Eric Schmidt. Speaking to The Guardian, Schmidt said mini versions of the unmanned planes used in modern warfare (in real life, not the game) could be used irresponsibly by the members of the public. 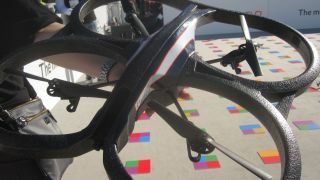 He also thinks devices like the Parrot AR Drone (pictured), could be used as weapons by terrorists if they chose to strap explosives to the aircraft. He said: "How would you feel if your neighbour went over and bought a commercial observation drone that can launch from their backyard. It just flies over your house all day. How would you feel about it?" As the tech becomes more advanced and easily available Schmidt is concerned that it is "democratising" war, by giving regular folks access to the same tools used by the military. He added: "I'm not going to pass judgment on whether armies should exist, but I would prefer to not spread and democratise the ability to fight war to every single human being. "It's got to be regulated… It's one thing for governments, who have some legitimacy in what they're doing, but have other people doing it… it's not going to happen. "Maybe we'll even see the world's first drone strike against cyber-terrorists. That's how seriously evil part of this could be." So there you have it. While most of the world is concerned about Google invading their privacy, Google has its own worries, or at least its longtime former CEO does.